Times are that I’m called upon to evaluate a collection from an inheritance. Often the seller doesn’t know anything about philately so I have a huge advantage. Moreover, if I’m invited to the home just after the collector has passed away, given the emotional rush after the loss of a loved one, sometimes the family just wants the stamps gone. I’ll tell you how I prefer to handle it. Gently on the phone, I’ll ask the seller how long it has been since the collector’s passing. With the gazillion details that absorb the family in the weeks after a passing, thinking about the stamp collection ought not factor into it. However, sometimes the family needs cash flow, and the stamp collection is right there. I’m not the pushy sort. My interpretation of a good transaction is one where the seller (widow?) lies in bed six months hence, smiling, knowing she’s done right. The worst thing a dealer could do is intrude during the mourning period. I’ll explain that there’s two ways in which I can be helpful. My company can either purchase the collection, or we can accept it for public auction. Some collections are not appropriate for auction, while some holdings should only be sold at auction. It might be that the material in discussion is something which my company isn’t comfortable with so I will recommend another company. Most likely the family won’t know the value of what they’re selling. The auction company works on commission to realize the best (highest) price. Keep in mind that an auction company that does only classic U.S. would be inappropriate for Argentina so "not one size fits all." Most houses work across the board, and some handle only one area. While my company is best known for China/Asia, U.S. and worldwide amounts to 70% of what we do. In stressed economic times like now, not everyone is positioned to wait the months that selling by auction necessitates between the date of consigning, the auction sales date, and some time hence until the auction company collects from the buyers to pay the seller. Thus selling outright is appealing. How to do it best? Take advantage of the relationship the collector had with his favorite dealer. It’s matching up a more willing buyer at a bit higher price with the family. Think of it as "continuity." A specialist dealer will understand the material better. Be a good thing for the collector to place with the collection, or give his executor, the names of dealers or auction houses he trusts. Remember businesses fade just like collectors pass on. It’s ironic that a collector can focus such time and money on his collection yet not anticipate the bewilderment the beneficiary of his estate feels out of the lack of knowledge on how to best sell the collection. Think "deer in the headlights." Strong-willed family members, never interested before, suddenly want the collection. A stamp club buddy pops in, saying the collection was promised to him. Think it couldn’t happen? I’ve seen wonderful collections piecemealed out on eBay, handed off to a teenager for describing and listing just because he is computer savvy. Following that thought, I’ve purchased excellent material misdescribed on eBay, only to resell it most profitably elsewhere. To protect the beneficiary, leave names and instructions. Who do you trust? It’s that simple. I’ll give you an example how this might work. Charlie Otstot had passed on some years ago, but not before telling his wife that, when I came to town, I should be given an opportunity to buy his stamp collection. She waited until my company had a table at NAPEX, the fine show held outside of Washington, D.C. Her CPA recommended that she obtain another offer before I arrived. A few days following the show, after I looked over the impressive collection, I opined the collection would realize about $100,000 at auction so my cash offer would be a bit less. Mrs. Otstot was greatly shocked as a dealer had offered $30,000, to which I blurted out "not by a friend." 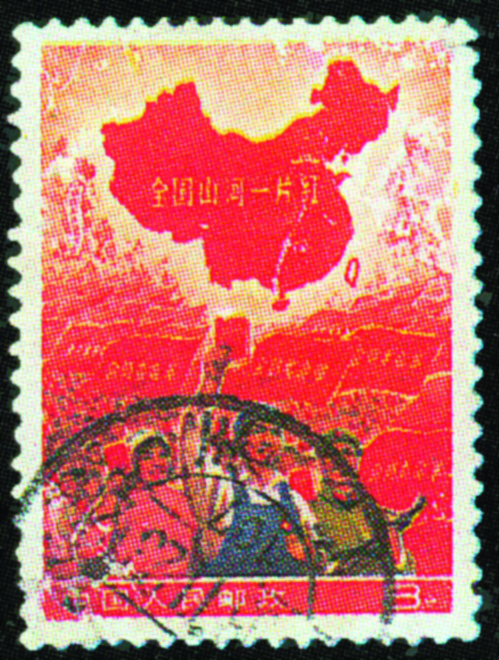 The PRC 1968 "All China Is Red" mint and used examples were worth more than his offer! Since the causation of the sale was Charlie’s passing and not an immediate need for funding, I recommended the collection go into my auction. More money for Mrs. Otstot and my company earned its fee. Certainly any dealer should be an American Stamp Dealer Association and/or American Philatelic Society member. Both societies have high standards for membership while it’s quite easy to be expelled for poor conduct. Ask for references: do your due diligence. No question is a foolish one. Play by the rules: if you’re going to get two offers, don’t reveal the first one. Not only isn’t it fair, you might have been offered more. If someone is traveling to you, be prepared to make a decision on the spot, to avoid the necessity of two trips to you. Time is money. Regret the time or money expended on the collection? My Katie recently opined when I repeated the comment, that she got a warm feeling, knowing that I would be in our den, playing with my stamp collection when she was visiting her mother. I could have been out at a pub instead! She thinks me dependable.